Homeland Review: Carrie and Maggie's Sister Act Saves the Otherwise Tedious "Clarity"
Had the series not already made such wild swings between Keane the sympathetic victim and Keane the ruthless tyrant, the episode’s dicking around on the subject of the 25th—and her paranoid response—might be more compelling. As it stands, Bridges uttering “Plunge this nation into crisis or defend it from its real enemies” as Keane chooses Saturday Night Massacre: Redux reads as a sudden contrivance, designed to give Saul (Mandy Patinkin) and company a short timeline for the season’s final two episodes. On which point: One of the reasons I love Sandy (Catherine Curtin) is because it is always a love story with Homeland. I hope she’s brought on for Season Eight. More importantly, chasing down failed novelist turned cyber warrior Yevgeny Gromov (Costa Ronin) and his paramour, Simone Martin (Sandrine Holt), provides the pretext for Saul to lure Carrie (Claire Danes), fresh off another round of ECT, back into the field. (At Dante’s memorial service, when he asks if she can be ready in four hours and she says, “If I hustle,” I grinned: For better and for worse, I’m so thoroughly invested in these characters I need to see the damn thing through.) If you believed for one single second that Carrie would hold firm to “putting the job behind me once and for all,” you haven’t watched 82 frigging hours of this sometimes masterful, sometimes abhorrent, somehow addictive TV program, and even so I couldn’t be more excited to see Carrie, sans Franny (Claire and McKenna Keane), call the shots on a dacha raid outside Moscow. For all the tedium of “Clarity,” which is—despite the title—far more setup than payoff, it really does have the feeling of a farewell to a truly misconceived (and mistreated) character, although that sense of finality comes more from Carrie’s sister, Maggie (Amy Hargreaves), than from the last interaction between mother and daughter. I suppose Homeland may yet pull the rug out from under me, but “Clarity” closes the circle on Carrie’s fraught relationship with her family, even alluding to Maggie’s under-the-table treatment of Carrie’s bipolar disorder, which was among the secrets that propelled Season One. Unlike the Keane subplot, the series has made a genuine attempt to build to this moment, from Maggie’s long history of caring for Franny while her mother was out of pocket to Saul’s reminder that Carrie has tried, and failed, to distance herself from intelligence before. Even the way Carrie and Maggie both describe what’s happened this season as “what always happens” suggests the harmony of a denouement. 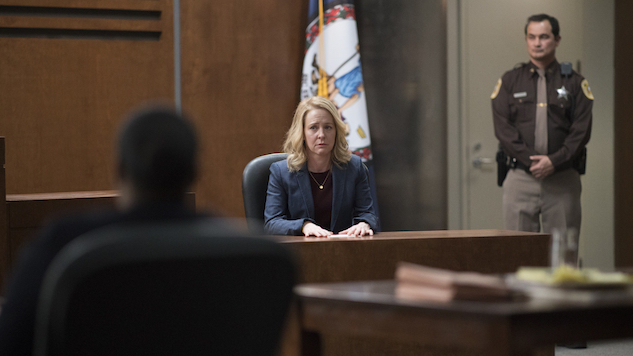 Indeed, its flaws aside, “Clarity” earns the emotion of Maggie’s courtroom monologue, in part because she underlines on the through lines of the entire series: Our protagonist’s illness and her insight are linked, her mind capable of drawing connections and conclusions no one else can. In the end, “Clarity” finds Carrie throw in with her chosen family—Saul, mainly, but also The Work—because her actual family finally gives her permission to do so. “I am not extraordinary like you,” Carrie, Maggie says. “I’m not a hero.” Which means it’s time, one hopes, for the heroics to begin again.